So begins the iconic scene in Frankenstein, which was first published in 1818. While Shelley infused a spark of life into science fiction, Alessandro Volta helped foster innovation in the field of electrochemistry through also trying to “spark life” into a lifeless thing — literally. Born into a noble family in Como, Italy, on February 18, 1745, Alessandro Volta received a first-rate education at a Jesuit-run school of rhetoric and showed an aptitude for languages. In addition to the humanities, he was fascinated by chemistry. When he was 18, Volta took up a correspondence with the French clergyman, physicist, and electrical experimenter Abbé Jean-Antoine Nollet. Volta proposed to Nollet that electricity follows Newtonian laws of attraction, which led Nollet to encourage Volta to perform experiments of his own. 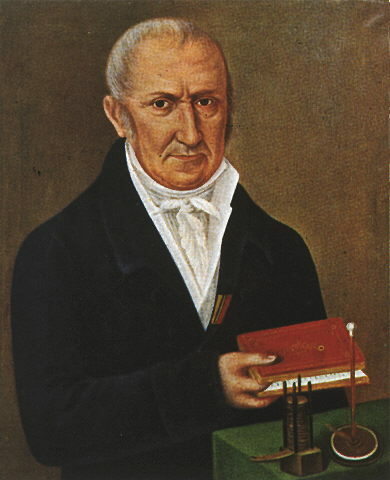 Alessandro Volta. Image is in the public domain in the United States, via Wikimedia Commons. In 1774, Volta became a professor of physics at the Royal School of Como. A year later, he improved upon and popularized the electrophorus, a device used to produce static electricity. He then became interested in the study of gases, finding inspiration in a paper by Benjamin Franklin that discussed “flammable air”. Volta studied this phenomenon in the marsh gases around nearby Lake Maggiore, which led him to discover and isolate methane. As he continued to experiment with methane, Volta also developed separate means to study both electrical potential and charge, and discovered that for a given object, they are proportional. This proportionality is known as Volta’s law of capacitance. Like novelist Mary Shelley, Volta found inspiration in the increasing number of medical experiments of the time. Many of these demonstrations involved the effect of galvanism, which in a medical context is the contraction of a muscle that is stimulated by an electrical current. Galvani studied how static electricity generates physical responses in dissected frogs. He and his team noticed that when they applied a scalpel to a frog’s crural nerve, the leg would twitch and draw a spark from the electrostatic generator. 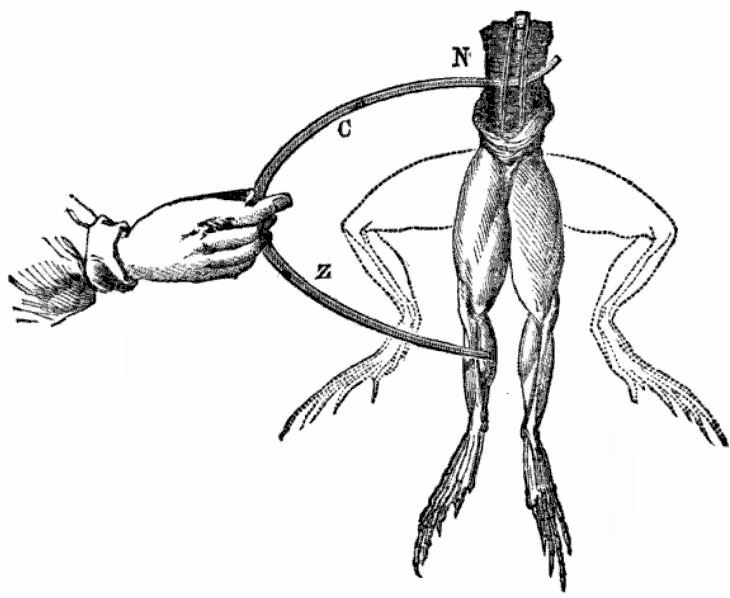 Galvani experimented by attaching frogs to different types of metal — such as brass and iron — to see how it affects the contraction of their leg muscles when met with a spark of electricity. Through his research, Galvani concluded that animals contain an electrical fluid in their muscles, and that their nerves act as conductors. The theory became known as animal electricity. At first, Volta was interested in Galvani’s papers, but he soon began to doubt the validity of animal electricity as Galvani defined it. Volta argued that it was not the animal matter itself that caused the contractions — the tissue was simply reacting to the electricity. 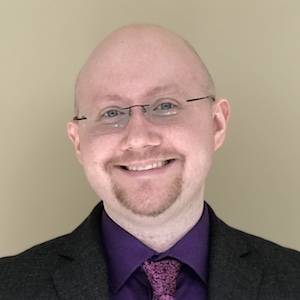 Instead, he focused on the connection between the two dissimilar metals (the iron or brass hook and the probe of another metal, such as the steel of the scalpel blade) as the generator of the current, not the frog parts. He posited that frog legs serve as conductors for current and can be replaced by any moist conductor. To help prove this, Volta tested different combinations of metals on his tongue, using his own saliva as the conductor. Volta’s competing theory, known as metallic electricity, sparked a sizzling debate between the two scientists. Electrodes touch a frog, and the frog legs twitch upward. Image in the public domain, via Wikimedia Commons. Volta eventually debunked Galvani’s theory of animal electricity by reproducing the experiment using nonanimal materials. In 1794, he demonstrated that he could replace the frog legs with brine-soaked cloth or cardboard, arrange them in a circuit with two dissimilar metals, and still produce an electric current. He ranked the types of metals according to their strength and electrical effects, and found zinc and copper to be the most effective. In 1799, Volta considered an animal that actually does produce electricity: the electric eel. Eel organs are made up of thousands of electrolytes, which, when working in tandem, can generate up to 600 volts. Volta modeled how fish cells are arranged using metals and nonanimal electrolytes alone, which led to his creation of the voltaic pile, the first electric battery that is able to provide a continuous electric current. 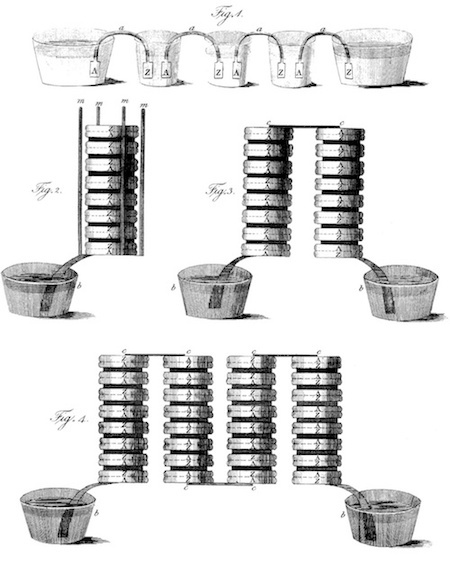 Original drawing by Volta of the voltaic pile in different configurations. Image in the public domain, via Wikimedia Commons. By 1800, the voltaic pile was complete. Volta stacked alternating discs of copper and zinc, which served as the electrodes, separated using damp cloth or cardboard that served as the electrolyte. Then, he connected the contacts with a wire from the top to the bottom, causing a current to flow through the voltaic pile and wire. This battery is credited as one of the first electrochemical cells and is the reason why Volta is credited as a founder of electrochemistry. The battery was a hit among scientists, including William Nicholson and Anthony Carlisle, as well as Sir Humphry Davy and Michael Faraday, who used the battery in their studies of electromagnetism. Napoleon Bonaparte also took an interest in Volta’s work. In 1801, Bonaparte invited Volta to perform a series of lectures and experiments before the French National Institute. Bonaparte was not content merely watching Volta; he wanted to get in on the action and eagerly assisted with many of the experiments himself. 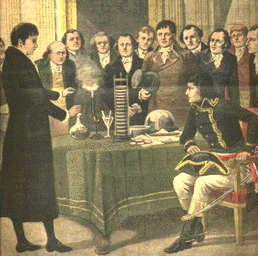 Volta explains his voltaic pile to Napoleon Bonaparte. Image in the public domain, via Wikimedia Commons. After enjoying much success, Volta retired to a private and quiet life in 1819. After his death in 1827, the unit of electric potential and electromotive force was named the “volt” in his honor. Volta’s research proved Galvani’s theory of animal electricity wrong, but he continued to acknowledge his rival’s contributions toward the field of electrochemistry with great respect. In addition, Volta greatly contributed to the pursuit of understanding and applying electricity for humanity’s gain. Modern society depends on batteries, and researchers continue to build on Volta’s methods, insights, and contributions to electrochemistry. In honor of his lasting achievements, let’s wish Alessandro Volta a happy birthday!